When you try something new, there’s no hiding that you’re usually very bad at it. For many, the easiest way to eliminate that feeling of angst is to quit practicing and go do something else, so that’s what most of us do. Take me for example, I love music. In fact, going into school, my choice was science or music. I knew I didn’t want to be a teacher so I chose science, but continued to take music as a minor and while I stopped playing the flute and sax, continued with piano whenever I could get my fingers on the ivory and singing. Over the last 10 years, life has gotten in the way and these days aside from singing in the car, I’m not very musical. I decided that perhaps I would take up a new instrument, guitar, because I have lots of family and friends that play, I would be able to sing and play and unlike a piano, and I can take a guitar virtually anywhere I want to. I did not however, consider the angst I would feel for not being good at an instrument as soon as I picked it up. Nor did I consider the fact that when I play piano or sing, even from memory, I visualize the notes I am playing or singing. When I pick up the guitar, I can’t visualize the chords (yet) and that has been paralyzing….and more than just a bit humbling. I know that practice makes perfect and I have resolved to start taking lessons, get out of my head and just try. What does this have to do with infection control or the use of disinfectants? Well, as I’ve talked about in past blogs, perfecting cleaning and disinfection practices can save lives. More importantly however, practicing the safe use of disinfectants will save lives. Did you know that more than 30 million workers are exposed to hazardous chemicals in their workplace? In North America, because of the safety concerns we have programs like OSHA in place to protect workers. Most of us would immediately think of the SDS as a need to ensure that information on the product is readily available. While the SDS provides valuable information, many overlook the importance of Work Place labels. Back in 2015, I wrote a blog “Mommy, this water tastes funny” where a son of a friend of mine drank bleach. It had been decanted into a water bottle by cleaners while they were on vacation and left on the bathroom counter. The bottle looked exactly like the bottles of water he had been drinking from for the last several days. I also know of a story of a healthcare facility where spent hydraulic fluid had been put in an empty Enzymatic Instrument Cleaner bottle and put under the sink…the sink where instruments were reprocessed. No one realized what was going on until surgeons started complaining of the fact that instruments were slippery to touch. Just last week, one of my teammates took a call from a veterinary clinic who had taken a bottle of diluted disinfectant and used it in their dental water lines, mistaking it for a bottle of distilled water. They performed several procedures with pets and were concerned of the side effects for potential ingestion of the disinfectant. The long and the short is that we need to be safe. We need to protect ourselves and we need to protect our employees. 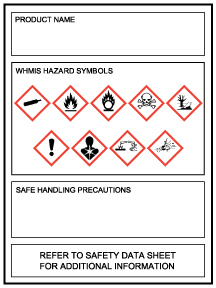 Ensuring that every bottle of chemical you have in your facility is properly labelled with a work place label is a very important safety step!